Saudi Arabia has agreed to increase its oil production up to 2,000,000 barrels, US President Donald Trump said on Twitter Saturday as he requests OPEC members to make for Iran and Venezuela’s oil production deficit. “Just spoke to King Salman of Saudi Arabia and explained to him that, because of the turmoil & disfunction in Iran and Venezuela, I am asking that Saudi Arabia increase oil production, maybe up to 2,000,000 barrels, to make up the difference…Prices too high! He has agreed!” Trump tweeted. There has been no comment from Saudi authorities. 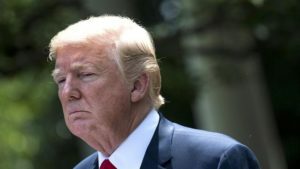 Trump’s request came amid the United States’ pressure on allies to halt importing Iranian oil as part of tactics to mount economic pressure on the Islamic Republic. Trump last may tore the Obama-era nuclear deal signed in 2015. The deal curbs Iran’s nuclear promise in exchange for gradual lifting of economic sanctions. Written by: KanelkaTagba on July 2, 2018. Posted by KanelkaTagba on Jul 2 2018. Filed under Energy, Headlines, World News. You can follow any responses to this entry through the RSS 2.0. Both comments and pings are currently closed.